PICTURED back row l to r 1st Hunters Hill Joey Leader Gigi Merel, Moocooboola District Joey Leader Beth Mitchell, 1st Hunters Hill Cub Leader-in-training Caroline Lloyd, 1st Hunters Hill Scout Leader and Leader-in-Charge Tony Atkinson, 1st Hunters Hill Cub Leader-in-training Nicola Riches, Turumburra District Joey Leader Jim Baldwin, 1st Hunters Hill Joey Leader Kathy Ward, District Commissioner Peter Nevin; front newly invested 1st Hunters Hill Joey Scouts Vincent, Cooper, Henry, Charlie and Nathan. First Hunters Hill Scout Group recently invested five new Joeys and two new Cub Leader Trainees and presented certificates of adult leadership (COAL) to new Joey Leaders Kathy Ward and Gigi Merel during the regularly-scheduled Joey mob meeting in the Scout Hall in Durham Street, Hunters Hill. On this special occasion, the Group welcomed their new Joeys and Leaders after a 10-year hiatus in Joeys, and Cubs in recess for the last couple of years. The five new Joey Scouts invested by 1st Hunters Hill Scout Group were Vincent, Cooper, Henry, Charlie and Nathan. 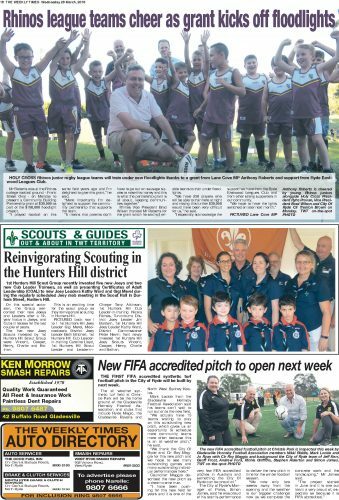 This is an exciting time for the scout group as they reinvigorate scouting in Hunters Hill.